2016 is going to be another amazing year in the Eugene real estate market! 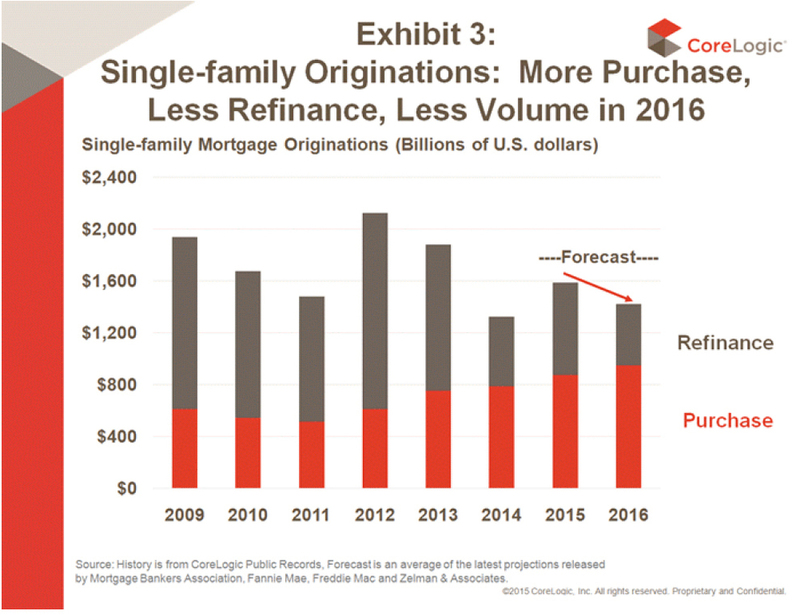 Prices will continue the steady increase due to lack of inventory partially driven by the inability of owners who purchased or refinanced during the bubble to sell because of lack of equity. Normal turn-over is 6 – 7 years, but as the chart below shows, people who purchased between 2005 and 2008 may still be upside down in their loans. Demand pressure comes from the fact that Oregon, for the last several years has been #1 in the country for inbound moves. Also – Eugene recently appeared on the top ten list of cities for tech industries to locate. Look for inventory to increase slightly in the spring when the Daffodils pop but it will continue to be a seller’s market throughout the year. Buyers will be out in droves in the Spring bringing increased pressure to the homes that come on the market in the Spring. Interest rates will rise to around 4.5% by year end, but will still be at historic lows. If you have equity in your home and want to make a move, you have the opportunity to be a big fish in a small pond. I must caution you though that you are dealing with an era of consumer awareness that is unprecedented. Buyers are aware of what the real market value is before they even enter the house. What this means is that homes that are priced correctly will move quickly, but homes priced above market are sitting on the market and many times will eventually sell below market value. As the chart shows, anyone who purchased before 2005 and after 2008 and has not refinanced may have enough equity to make selling a feasible option. If you want to know your home’s estimated value for 2016 please contact me at 541-953-7165 or ron@rontinsleyrealtor.com to arrange for a comparative market analysis (CMA). We can then take that figure and compare to your loan balance to see if it makes sense to sell at this point. It is more important than ever to be prepared to compete. 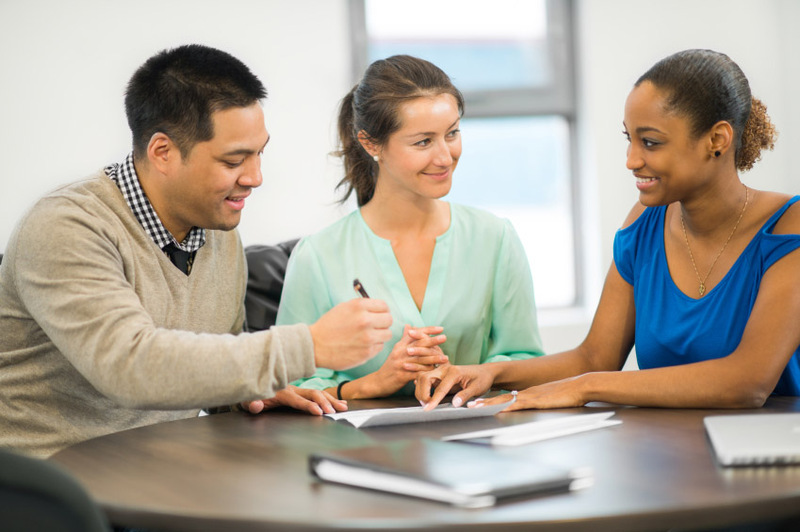 Get preapproved by a local lender before you begin shopping; the preapproval letter will assure sellers that you will qualify for the financing you need to close the deal. In close multiple offer situations, cash buyers usually win followed by buyers who have preapproval from a strong local lender. If you need a list of dependable local lenders please contact me. Do your research, and if you see a home you want, make your best offer first. If you make a lowball offer in a multiple-offer situation, the seller may not give you time to make a higher bid. You could include an escalator clause to increase chances, but sellers prefer knowing how high you’re willing to go the first time around. Decide ahead of time the maximum amount that you are willing to pay, and stick to that. Generally in a multiple offer situation the listing broker will give your broker a chance to submit your “highest and best” offer, but you can’t depend on it. There are many other means of making your offer more attractive to sellers. 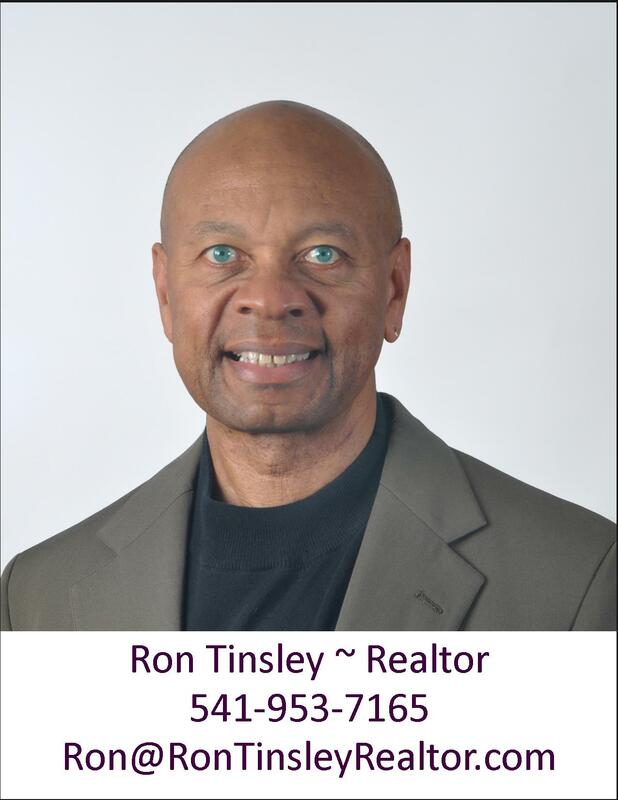 Please contact me 541-953-7165 or ron@rontinsleyrealtor.com if you are interested in learning ways to better your chances. The 4th Quarter of 2015 wrapped up the strongest year we have seen in the Eugene market since the mid 2000’s and the strongest ever for closings in MLS history. Year over year 4th Qtr to 4th Qtr we saw strong improvements and continued growth. Pending home sales increased 31.5%, the amount of sold properties increased 16% and the inventory level of homes for sale decreased by 30%. The overall activity was higher with less inventory to choose from which kept the market very strong in the 4th Qtr. Days on market were down 20% year over year and the months of inventory during the 4th Qtr averaged 2.4 months, which is down 48% from a year ago. 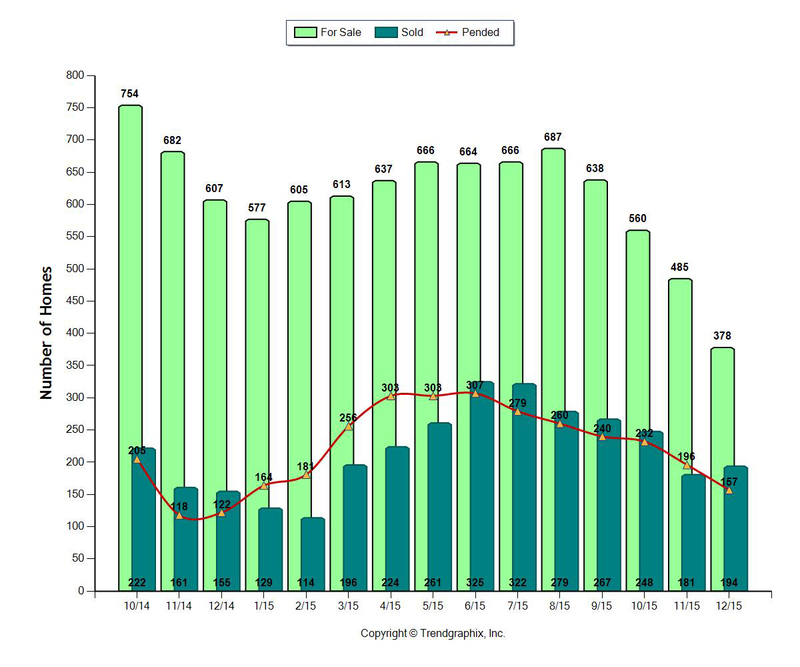 The graph shows activity for the Eugene real estate market over the past 15 months. 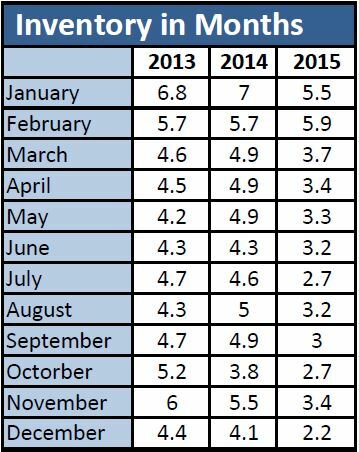 The market has continued to improve year over year since 2012 and the 4th Qtr of 2015 was an example of that. 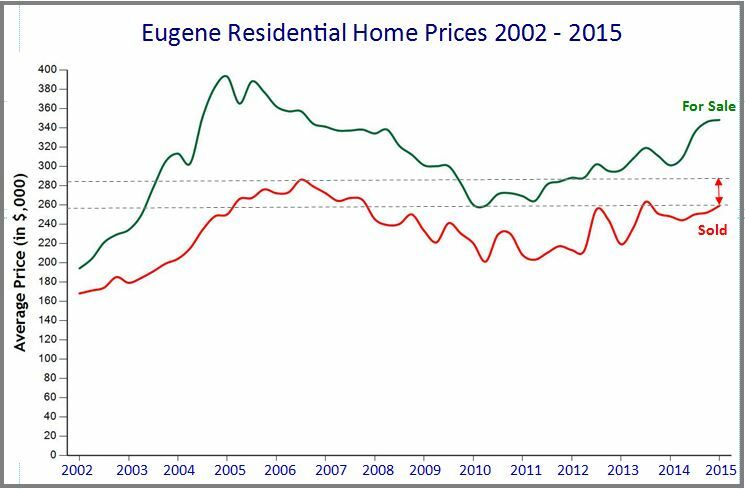 2015 was an excellent year for the Eugene market and it sent us into 2016 with great momentum. Well priced homes continue to sell in a matter of days and the competition in the market has kept prices strong and growing. Interest rates still remain at historic lows and the overall market is continuing to see consistent appreciation. Inventory* is a low 2.4 months, down from 4.4 months in December 2013 and 4.1 months in 2014. These low inventory levels have contributed to a 3.4% rise in average sale price over this time last year. Low inventory levels have contributed to increased pressure on listings because of supply and demand, with well priced listings selling quickly sometimes with multiple offers. Total market time for Lane County across all price ranges ended up at 84 days with homes $250k and below getting the most pressure and $300k and above having more time on the market. Following the housing market's best year in nearly a decade, existing-home sales are forecasted to expand in 2016 at a more moderate pace as pent-up buyer demand combats affordability pressures and meager economic growth, according to National Association of Realtors® Chief Economist Lawrence Yun in a newly-released video on his 2016 housing market expectations. Yun points to pent-up demand, sustained job growth and improving inventory conditions as his reasons for an expected gain (from 2015) in new and existing home sales. Overall purchase demand may lift 2016 home sales to the best year since 2007. 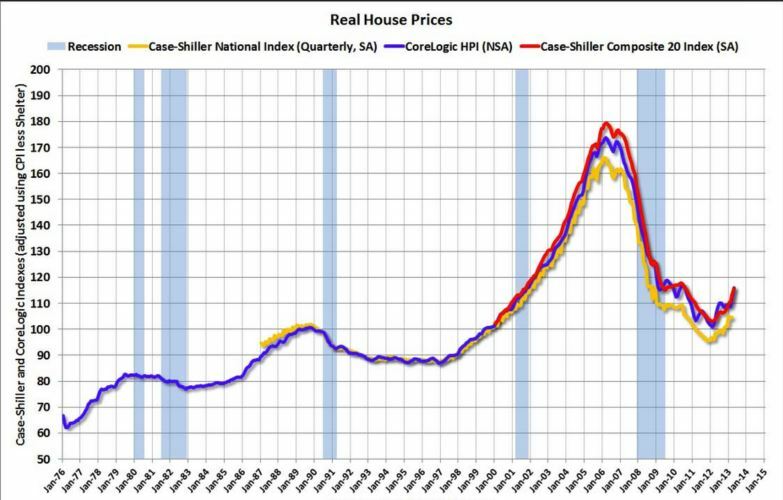 Nationally, home prices will likely rise at a quicker rate than inflation, but not at the same rate as last year. The CoreLogic Home Price Index showed a year-over-year increase of 6 percent in the last 12 months; however, 2016 is only expected to see increases of 4-percent. This increase in home sales and home prices can be attributed improved economy. As we approach the start of 2016, the consensus view among economists is that economic growth will continue, and the U.S. will enter an eighth consecutive year of expansion in the second half of next year. Most forecasts place U.S. economic growth at 2 and 3 percent during 2016, creating the best back-to-back years for employment since 1998-99, and adding to thegenerally upward movement of the real estate market. The graph above shows the 2004—2007 anomaly that was the 2004—2007 bubble. Selling a house is one of the major decisions in your life. How you approach it will make a massive difference in whether the outcome is positive and quick or a long drawn-out grueling task. There are some things that you can do to make the process easier and make your house more attractive. The first thing that you need to begin doing is changing your state of mind and how you look at your home. At this point you should begin thinking in terms of “the house” rather than “my home” this will help get you in the state of mind necessary to do some of the tasks that you are going to have to do. You are going to have to mentally and emotionally remove yourself, your personality and connection to this house, and move on to the next house in your life which will become you “home.” In other words, your job right now is to prepare this house – that used to be your home as a blank slate for the next inhabitants of this house. Buyers need to be able to walk into this house and envision themselves, their children and belongs inhabiting this space. They can’t do this if your personality permeates everything about the house. .
We as Homo sapiens tend to express ourselves through our music, bumpers stickers and many different avenues – including colors. Colors are very personal and what looks really good to one of us may be a total turn-off for others. This is fine in the course of everyday life, but when it comes to whether your house is going to be attractive to a prospective buyer or not, it could be the difference in whether they just do a quick drive-by and turn up their nose, or stop and investigate further. What does this mean? As much as you love it and though you are proud of how it is an expression of your feelings -the fire engine red den may have to go! Unless that is you are marketing to the small select group of folks in your town that have that very same affinity for fire engine red dens, which limits your market for selling your house to even a smaller niche within the niche of people that happen to be in the market at that time. I’m not sure that there is actually a color called “realtor’s beige”, but that’s what we call it. Beige or shades of neutral colors are non-intrusive to all and leave your walls a blank slate which allows people to imagine what color would look good on that wall. Exterior colors – once again we are shooting for colors that are attractive to the majority of people – which pretty much eliminates the Reds, Yellows, Purples and other bright colors that you might love but the majority of the population may not. I got a call from a couple in their late 50’s wanting to see a home in South Eugene. I arrived early to get the house open and watched as they approached the house. I said to myself, “Looking for a 1600 to 1800 square foot home; single-level with a low maintenance yard.” During the tour, I asked, “What exactly are you looking for?” They repeated, almost verbatim, what I had predicted. No – I’m not psychic, I just know that there is a tremendous number of baby boomers who, after seeing their last child off to college, realize that the 3500 square foot, 3 story home just means more bathrooms to clean, more stairs to climb and more lawn to mow. Statistics show that somewhere around 35 – 40% of Americans between the ages of 50 and 65 are planning to move within the next 5 years. Less maintenance and fewer household tasks equal more free time. Lower or no mortgage payments: you may be able to sell your present home and pay cash for your smaller home – or at least have lower loan payments. Lower taxes: smaller home and a smaller lot generally mean lower taxes. Lower utility bills equals more money in your pocket. With the sale of your larger home and the purchase of a smaller, more economical home – you should have more money to put towards your retirement savings or children’s education. More sustainable lifestyle: sell to a family who needs the larger space and inhabit the smaller space you need. Guest room(s). You might think that once the kids are gone – they are gone. But, if life throws them a curve ball, it’s comforting for them to know that there’s a place for them to land. This same room can double as a guest room or office. Single Level or 2 Story? It’s worth the effort to seek out single story homes if at all possible, if not – at least try to find something that has the master bedroom, bath and laundry on the main level. Mobility. With maturity comes physical limitations. If this is the home you want to retire in, research proximity to shopping, restaurants and access to medical facilities. You can find a home’s walking score by going to www.walkscore.com. Sell before you buy, or buy before you sell? Making an offer contingent upon the sale of your present home puts you at a disadvantage if there are competing offers. Many sellers will balk at accepting your offer unless you already have an accepted offer on your present home. At the very least, they will want to know that your home is priced competitively. Also – most real estate agents will tell you that vacant, staged homes are much easier to sell. It’s easier for a buyer to imagine themselves living in the house when your “stuff” is not there. Vacant homes are more convenient for realtors to show as they can easily include your home in scheduled or un-scheduled tours. Timing: As someone who works in the industry and has their finger on the cycles, a realtor is going to be able to help you evaluate when to make the transistion. 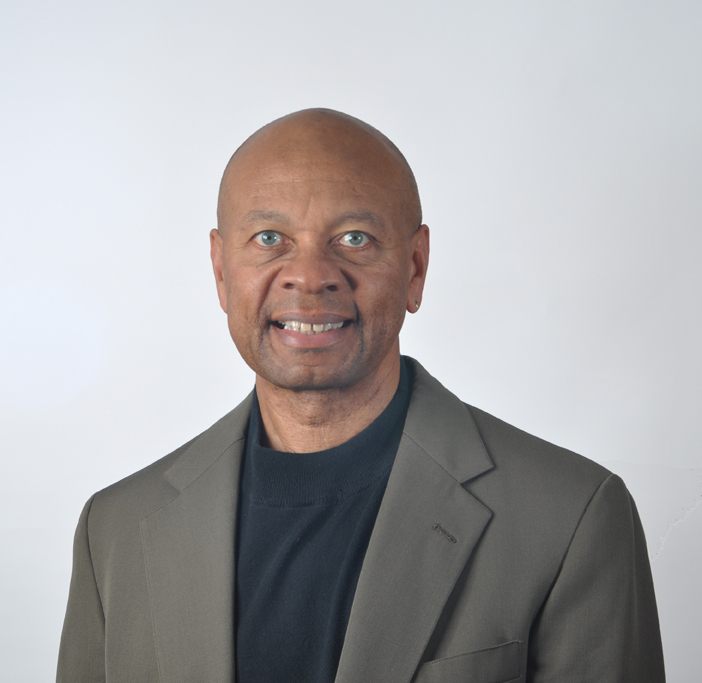 If you need a referral to a knowledgeable Realtor in your area, feel free to call or email me, and I would be glad to connect you with a good Realtor©. How do you fit 3500 square feet worth of stuff into 1800 square feet? You don’t! So what to do? Take a walk through your home with a critical eye. If you haven’t used something in the last year, ask yourself, “Do I really need it?” Come up with a list of things that you don’t need. Larger items can be sold on Craigslist or Ebay, for the remaining items, a garage sale is a perfect way to reduce your possessions, and at the same time advertise your home for sale. Have your agent produce flyers for you to hand out at your garage sale. As with anything, planning is the key to success. Approach downsizing in a pragmatic manner and your transition will be easier and less stressful. Having trouble finding the perfect Eugene Oregon home? Unfortunately, you're not alone. Low inventory and a large pool of motivated buyers have created challenges in the Eugene real estate market. Many listings are receiving multiple offers, and well-priced homes are selling very quickly. Don't let a competitive market discourage you from finding the Eugene home of your dreams. Here are a few smart tips to come out on top in a seller's market. Get your fin ances in order. When it comes down to the negotiating table, sellers are looking for a serious buyer who is able to provide a firm contract as soon as possible. Speak to your mortgage lender and obtain a pre-approval letter indicating that you will have no issues with financing. Receiving approval can take a few days depending on the lender, and it's always wise to get a head start. Know your strengths. Although the purchase price is the most important consideration on the contract, sellers have a number of other contingencies to consider when reviewing your offer. Can you provide a flexible closing date? 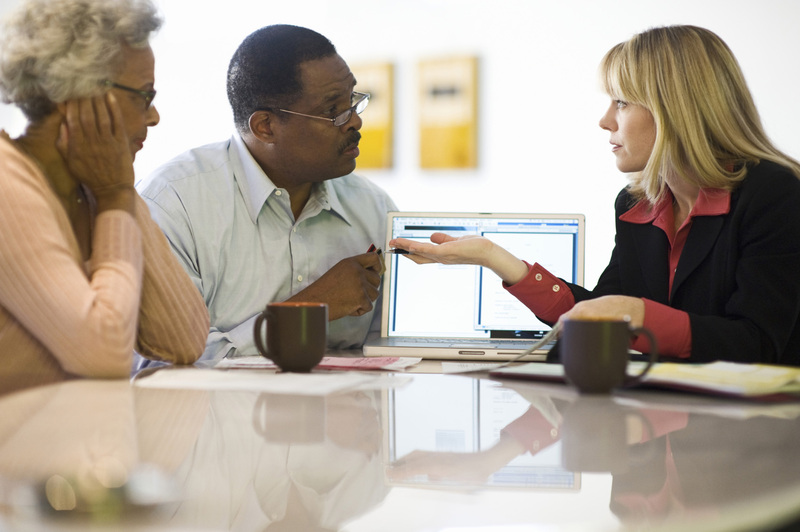 Let your Realtor© know so you can use it as a bargaining tool. Another offer may be on the table for more money, but their preferred closing date could inconvenience the sellers. Have your Eugene real estate agent find out what the sellers are looking for, and see if there is anything you can do that will make the transaction more convenient for them. Do your homework and be competitive. Your Realtor's© knowledge is the most valuable tool when determining a strong and successful offer. If you know ahead of time that you are in competition, it's usually advisable to bring your best offer forward right away. This will show the sellers that you are a strong contender, and you aren't simply testing the water. Review recent sales in the area to make an educated determination about fair market value. You want an offer that is strong enough to beat out the competition, but not so high that you will have buyer's remorse once the negotiations are complete. Make it personal. When sellers are reviewing multiple offers and they are parity offers, you need something to make yours stand out. The simple thing that you can do that works almost every time – write a letter to the seller letting them know what a wonderful house this is and how much you look forward to living in it and raising a family (if applicable). Say things like “I really look forward to tending to roses – or the raised beds and point out little things about the house and neighborhood that attracted you to it. Lay it on thick! You would be surprised how often this will win the day. I have even won over higher competing offers this way! Utilize the help of a local professional. Moving to a new city? Relocating to a different part of to wn? Hire a Realtor that knows your preferred area. Local expertise is invaluable. In a hot market, you need to work with a Realtor© who is well informed and can help you act quickly. When the right property comes on the market, there is no time to waste. Your real estate professional may also have the inside scoop on properties that are about to hit the market, and can give you sound advice when deciding between neighborhoods. Finding the perfect Eugene home is a great experience, but having to fight for it can be stressful. Making smart decisions with the help of a knowledgeable real estate professional is essential to for a smooth transaction. Don't let a little bit of competition make you shy away from your next move. Your ideal Eugene home could be closer than you think. Considering making the leap from renting a home to becoming a home owner for the first time? Financial experts don't always agree on the best way to keep a roof over your head, because there are advantages and disadvantages to both scenarios. You have recently claimed bankruptcy or you are working through some challenging credit issues. Rent rates are determined based on the property itself, not the financial situation of the borrower. Mortgage lenders tend to reserve their most competitive rates for those applicants who come to the table with picture perfect credit. Paying a higher interest rate on a mortgage will cost you thousands of dollars more, so it is often advisable to continue renting until your credit is repaired. You are only planning on living in one place for a short time. Will your home appreciate in value in a year or two? It may, but there are costs associated with selling a home, breaking a mortgage and moving. If you are only planning on living in one place for a short time, renting is normally a better financial decision. Home ownership pays off, but you need to be patient. You are in the process of a life transition. Life is full of changes like new jobs and new relationships. Sometimes the excitement (or stress) of a major life event can cause you to forget your long term needs and focus only on the home that works for you right now. If you are just coming out of university, or perhaps getting out of a marriage, it may be wise to rent for a year or two until you have a clearer picture of where you'd like to be. You are searching for a place to call home for at least a few years. The longer you live in a home, the more time you have to pay down the mortgage and build equity. Typically, owning a home is a better long term option than renting. With exceptionally low interest rates, many buyers are enjoying surprisingly affordable home ownership options in the Portland area. You want to live in a space that you can customize exactly the way you want. Do you love custom finishes and rooms that compliment your personal style? There is only so much you can do in a rental property without throwing away your hard earned money. Owning your own place opens up a world of options and lets you create a space that truly feels like home. You don't want to deal with paying rent (or a mortgage) when the time comes to retire. If your golden years are approaching, you are probably looking forward to leaving work behind and spending more time doing the things you love. Owning your home outright will free up more cash for traveling and whatever else you have in mind. 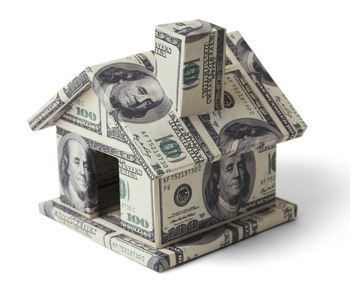 In most cases, home ownership is an essential component of financial freedom. Showcase your home's strengths. Do you remember what you first noticed when you purchased your home? Was it the large windows or a cozy fireplace room that made you decide it was the home for you? If you can't remember, ask your friends what they notice or think about the compliments you receive when guests come over. Stage your home to highlight its strengths so your property stands out from the competition. Complete any unfinished jobs. Take a walk around your home a make note of anything that needs to be repaired or replaced. Check your plumbing fixtures and touch up the paint if you spot any scuff marks. Those tedious jobs tend to pile up when we are comfortable in our homes, but it won't take nearly as long as you think to tackle your to-do list. A well-maintained home shows pride in ownership and gives buyers they confidence they need to make a strong offer. Focus on your curb appeal. The image of the front of your house is the first thing potential buyers will see when they come across your online listing. Similarly, the sign on your lawn will capture the attention of people driving through your area. Your home's exterior should set the stage and be a positive reflection of what can be found within. Clean up your garden and add some planters for some extra color. Remove any overgrown shrubs, and make sure windows and doors are clean. A new mailbox and welcome mat are inexpensive touches that show your home is well cared for. Remove clutter to eliminate distractions. Personal photographs, souvenirs and other sentimental belongings might make you feel at home, but they will have the opposite effect on prospective buyers. Keep table tops and counters as clear as possible. Pack away seasonal belongings and find a place to store unnecessary furniture. In most cases, less is more. Your rooms will appear larger and less personal. Many buyers love the idea of moving into a brand new home. Gleaming counter tops, flawless appliances, and a squeaky clean home await on the day that the sale closes. While there are many reputable builders in the Eugene area, it is important for buyers to understand the difference between buying a home from a builder's sales office as opposed to purchasing a re-sale home on the market. Concept drawings don't always show the full picture. Builder's drawings are meant to entice prospective buyers and persu ade them with a stunning image of a model home, surrounded by lush Oregon greenery. What the drawings don't always portray is just how close your next door neighbors are or how close the home might be to the road. Get a realistic perception of the floor plan. Particularly with condos, you will want to measure out rooms to see for yourself how large each space is. A 10×10 den might look like a perfect space for a spare bedroom, but how much furniture will actually fit in the room? Don't just take the plans at face value. Compare the dimensions to the home you currently live in so you know if the space is suitable for you and your furniture. Another simple trick is to measure your furniture, make scale model cardboard cutouts and see how they fit in the rooms. Enlist the help of a Eugene Realtor © to review your purchase agreement. In most cases, you will have a few days to review a purchase agreement before you sign off on a firm contract. Buying a new build is often more complicated than purchasing a re-sale home, mostly because you are buying something that doesn't actually exist yet. Have your Realtor review your purchase agreement to ensure that your expectations are being met, and you aren't making any false assumptions about the final product. Keep an eye on your upgrades. While it is important that the home you are purchasing is a place you love, remember that builders charge a premium for upgrades. In most cases, you will pay significantly more for granite counter tops and custom fixtures from a builder than you would if you did it yourself or hired a separate contractor. However, you are paying for the convenience of moving into a home that is perfect right from day one. Upgrades will most likely add value to the home, but do your research to decide on your must-haves before opting in to everything to builder is offering. Don’t be afraid to negotiate for upgrades, this is also where a your Realtor can help. Feel satisfied that you are getting good value for your money. There is nothing worse than buyer's remorse, especially on the most expensive thing you will ever buy – your home. Developers set their own sale prices, and negotiate only as they see fit. Even if you are adamant about buying a brand new build, take some time to explore a few similar properties in the re-sale market. How to the floor plans compare to the new home you have in mind? Are you getting a similar price per square foot? Could you find a better home for the same price in your preferred area? If the builder has other completed projects nearby, pay them a visit to see the quality of their work and get some feedback from previous customers about their experience. Don’t be too anxious, if you are of the mind that you can walk away from the deal, you are going to be in a better negotiation position. Buying a new home in Eugene is an exciting and rewarding process. Choose a Eugene real estate agent who can guide your search and help you make a smart investment.